Our first night at the anchorage was a baptism of fire. 30 knots and 1 metre waves hitting us, don’t know how we got any sleep. I can see why many cruisers bypass Broome altogether. It was a little hard to bypass for us with so little facilities available in the Kimberley, Broome is the last out post of civilisation and we’d like to top up with water and provisions, just that Roebuck Bay is a terrible anchorage. The tides are big here too, a 9m tide was coming in a few days, so made sure we had 50m of anchor rode out. We rowed into Town beach the following morning, 1 Nautical mile took us 35 minutes. (If you notice in this blog, when I mention “mile”, I mean nautical mile.) Then walked the 1 mile to downtown to look around. Broome is a pearling town, always has been. In the 19th century it was the biggest mother of pearl producer in the world, with over 300 pearling ships based there. Huge. The industry weathered all kinds of disasters, two cyclone taking 180 lives both times. (The Broome cemetery began filling up!) But what finally killed the mother of pearl industry was a chemical company in the U.S., namely Dupont, inventing plastic in the 1930’s. The world’s citizens who up till then had relied on mother of pearl to keep their shirts on… i.e. buttons, and Broome had 60% of the world’s market cornered. There were pearlers from all over Asia here, the Chinese and the Japanese with their 100’ pearling sampans and the Aussies using cheap ‘expendable’ aboriginal labour. Then the button makers found out about plastic and that was the end of that. By the late 1940’s Broome reverted to harvesting pearls instead, by comparison a much smaller industry. Can’t post about Broome without mentioning everyone’s favourite pirate, namely William Dampier. His journals of his triple circumnavigations were the hottest sellers back in Britain. He landed around here, somewhere, in 1699 and shot an indigenous fella then scarped to Timor, just to get water, as they had no luck finding any in Australia. (Too bad, the Kimberley waterfalls are just a few days sail from here, all the fresh water he’d need). Thus we have “Dampier Creek” and this bay and the pub named after his ship the HMS Roebuck. I last visited this place in the 80’s and boy has it changed! Population explosion, at around 40,000 with all the tourists. The trendy cafes are hopeless for meals, over priced and under portioned but the kebabs in the Egyptian restaurant opposite Coles are excellent (Susie says its the best kebab she ever tasted). The local indigenous still speak with their ancient dialects, never hear that in the city. The traffic is surprising, be careful you aren’t run down, travellers everywhere in 4WD’s, this is the dry season and the place is packed. Too bad Broome does absolutely nothing for cruisers, there’s very little here to attract them. Pity, Broome is a great town and deserves its reputation as a paradise. After a few days of being beaten up by the Roebuck anchorage another cruiser dinghied by and introduced himself, Brett on “Nikita”, a 36’ steel Pugh design sloop, let us know there’s room over in the Port area, just outside the port boundary which is a better protected anchorage. After the next row ashore, we came into a spot of bother coming back, a 2 knot current took hold of our dinghy and another cruiser came to our rescue, towing us back to Ashiki. That boat is too slow to row with a load, we’ll need to do something about that..
Sick of the lousy location we weighed anchor and motored the 2 miles to the port, anchoring only 600m from the shore this time, tucked in behind the big shipping pier, but a long trek into town. We have bicycles so this isn’t a problem. The anchorage was much nicer, but the dinghy we decided could be a problem, especially in the Kimberley because of crocodiles. 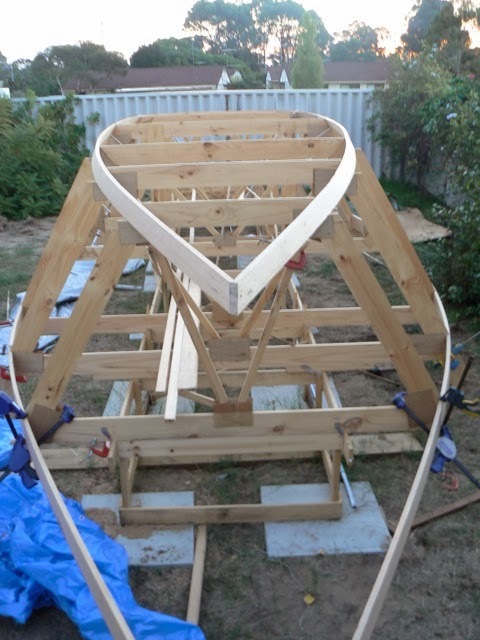 We discussed it and with our dinghy being more a planing hull rather than a good rower and we couldn’t very well obtain another one here in Broome, we decided to order an outboard. Now we are the proud owners of a 3hp Zongshen 2 stroke. Not fast, but it works and weighs only 10kg. It was ordered over the phone and the courier delivered it to the boat ramp opposite Ashiki, we watched him drive his van right down to the water as we were rowing ashore. Fine service I say! I normally try to stay away from this site–can't stand the envy. There was a time Taiwan built normal cruising boats and you still see them today. We were on a 40' example the other week, about 30 years old, lots of teak mouldings, very nautical. I can imagine sailing into Taiwan today, marinas have 100' berths only, they'd probably direct Ashiki to the dinghy dock!